Spokane’s emergency flu hospital closed its doors, after caring for 617 patients over three months. Only 12 patients remained in the hospital, and those would be sent to other hospitals or discharged. At the height of the epidemic, it housed 140 patients. A total of 68 patients died at the hospital. It was previously used as a hotel, and it would be turned back over to its proprietors. In other flu news, the city’s Sunday schools were reporting attendance at about 50 percent of what it had been a year ago. This drop was attributed to the ban on Sunday schools (and all church gatherings) during the height of the epidemic. Many parents apparently were still keeping their children home, despite the reopening of the Sunday schools. 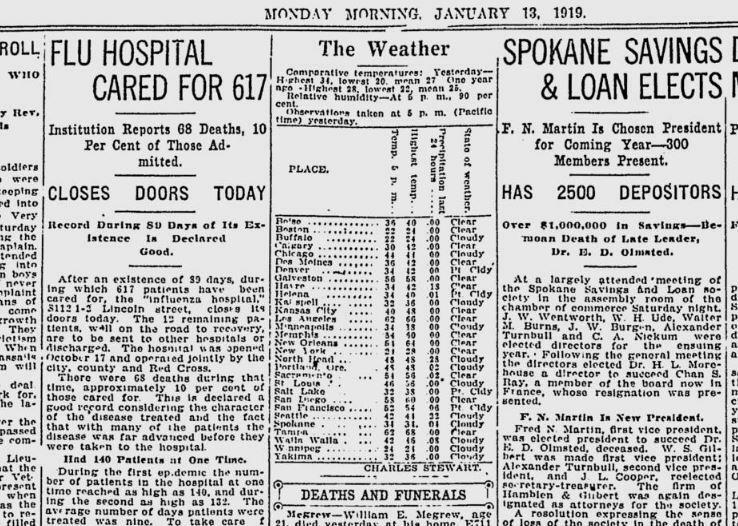 In Ritzville, the epidemic had not yet abated. All of the city’s doctors, school authorities and council members attended a meeting with a representative of the State Board of Health, who said the city was handling the crisis well. He did not advise closing all businesses and schools. He said that people afflicted with the disease should remain indoors for three weeks.